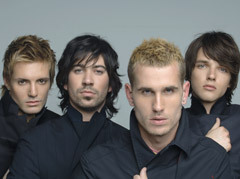 D’NASH is the first Spanish “boyband” consisting of four young boys voices with a unique stile and with a special magic for winning Eurovisión. 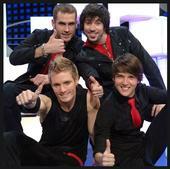 Mikel (Tenerife 1983) A graduate in audio-visual communication, actor, model and salsa dancing teacher. He is the most romantic of the group. Basty (Cadiz 1981) On the stage since he was a kid, he has travelled accross Spain performing as soloist with his band. He is a pilot and the sportsman in the group. Javi (Seville 1983) The benjamin and the joker of the group. Always connected with the music, he has sung soul in chorus and was a dancer of modern style. Ony (Valencia 1981) Outstanding singer from the school chorus, he has played in musical theathers. He has also been cinema actor and hip-hop teacher. The most passionate member of the group. “I Love You Mi Vida” came up from Rebeca, a successful singer with Puerto Rican blood who was born in Barcelona in a family of artists, and Tony Sánchez, a genuine eurofan from Canary Islands. They wrote the lyrics and counted on two Swedish composers, great experts in Eurovision: Thomas G:son, author of “Invincible” the Carola’s song of 2006, and Andreas Rickstrand. They thought in a so international sentence as “I Love You” followed by the very Spanish expression: “Mi Vida”, (“you’re my life”). The lyrics, in Spanish with some English lines and even deaf-muteness language, refer to a love story. I can’t be bothered with anything these days, but shrug. I just don’t have anything to say recently. hi nash you are amesing wee love you and you mikel. Hi D’nash i love you and specialy mikel i love you mikel.